Darth Maul is a chromium exclusive character that has been hanging around forever. He was always somewhat rare in chromiums and no doubt with Echo shards still hogging the best chances of dropping, he is probably even harder to get now. So he’s really something of a trophy for spending way, way too much money on the game. Fear not intrepid free to play dudes, Darth Maul in Star Wars: Galaxy of Heroes, while very fun, is very situational and you can survive quite nicely without him. Here is Darth Maul’s stats on SWGoH.GG. Our Darth Maul is at his gear max of level 10, lacking only a fusion furnace that would not get him to the next gear level. Although all of his omegas are very nice upgrades in DPS, the Darth Maul we are showing you today only has level 7 abilities with no Omegas fitted. It should be noted Darth Maul requires only fusion furnaces to get to his gear max. Darth Maul has always had two complaints: That he’s too slow and that he’s too squishy. Those complaints still remain and have only gotten worse since the protection patch. Even at his gear max you can see that even the AI has little trouble taking him out thanks to his poor health. Before protection his speed didn’t really matter. 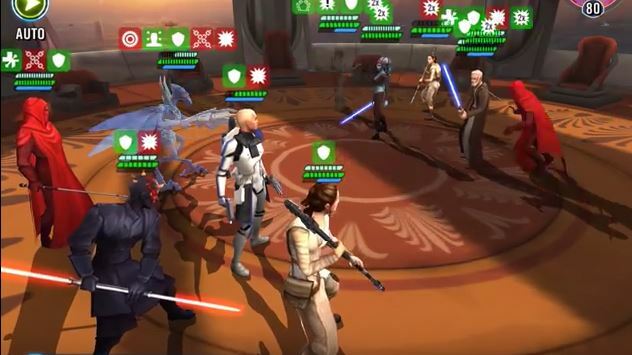 Get a Jedi down to a quarter health, let Darth Maul in Star Wars: Galaxy of Heroes get a finishing blow and he could probably one shot any remaining Jedi. With protection, one shots are not really possible any longer and since you’re lucky to find a team with two Jedi Maul is really just a below average slow attacker. While we disagreed with the “Buff Maul” sentiment before protection, we do think he needs a tweak now to address his speed and health. That’s the bad. The good news is that if he survives long enough to get behind a taunt his health steal and his health recovery after the third enemy has been defeated does give him some survivability. Though not enough to recommend him for arena. The really good news is that if there is an enemy Jedi on the opposing team he hits like Rey for 10-15k a shot. But again, Jedi on top level Arena teams outside QGJ are few and far between. Despite the fact that all of the auto battles were wins, it is our opinion that unless Jedi teams return to the arena Darth Maul should be considered a liability due to his low health and slow speed. Darth Maul in Star Wars: Galaxy of Heroes is a deadly Attacker that gains power and extra turns as enemies are defeated. In Raids, Darth Maul has no real utility other than providing slow, sub-standard damage. At best he’s on a 5th team DSP squad trying to get that last shred of damage with your seven star ugnaught, cup, mob enforcer, and URoRRuR’R’R. In Galactic War, Darth Maul in Star Wars: Galaxy of Heroes is crazy fun to break out when you run into an all Jedi Team, which is not terribly uncommon especially in the earlier nodes. As a fusion furnace max-DPS, he’s a good option to give your trash teams some easy DPS. So he ranks a bit higher here especially since he has some self healing abilities. Darth Maul in Star Wars: Galaxy of Heroes, in the right circumstances is a very fun character but suffers from low health, protection and speed. Against a Jedi team he is one of the best toons to have on your squad and against teams without Jedi he’s a sub-par attacker. He’s nice to have in your roster if you get him as part of your chromium fishing, but you really don’t need to fish specifically for Darth Maul. He’s a bonus, not a must have. * Indicates best case against Jedi Opponents. Against non-Jedi opponents subtract 3 points. Thanks to user pcx99 for creating this review for the Zam Wesell Review. What do you think of Zam Wesell in Star Wars: Galaxy of Heroes? Is he good or bad? Do you have any suggestions or feedback? Please feel free to leave a comment below. Be the first to comment on "Darth Maul Review – Star Wars: Galaxy of Heroes"